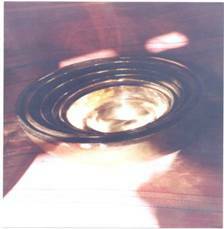 Order Your Master Quality Singing Bowl now! The master quality antique Singing Bowls that Aidan McIntyre offers are the unique product of India and the Himalayas. They are hand-forged in Nepal and Bhutan and are made of an alloy of various metals most commonly referred to as to bronze. Other metals such as gold, sliver, mercury, copper, iron, thin, lead and sky metal that is meteorite iron, which added to produce special alchemical properties. Each Himalayan Singing Bowl comes with a hand-made aspen wand that produces soft tones. Aidan McIntyre feels that aspen wood is especially "forgiving", as it is very easy for the beginners in art of playing singing bowls. These hand- hammered bowls produce a bell-like sound. Each bowl is different. 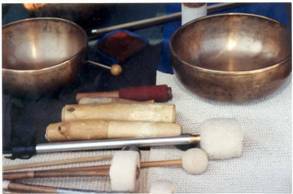 Smaller diameter Singing Bowls have higher tones, while the larger bowls produce a wider range of sound with rich dynamic "OM" tones. 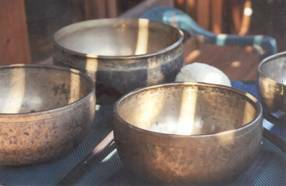 The Singing Bowls are excellent tools for healing practitioners and are a very personal and especially effective when used for healing, meditation and contemplation. The Singing Bowls are carefully chosen from the thousands of bowls Aidan encounters in his search. 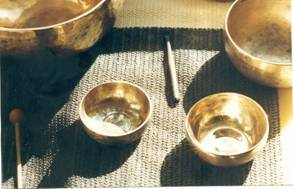 The Himalayan Singing Bowls that Aidan sells are the highest quality and are selected for their type of metal, age and most beautiful sound.